Today’s prompt for the 30 day journal project got me thinking, ‘Well…who am I?” I’ve been doing a lot of soul work lately, nourishing my spirit, quietening my mind and searching for inner peace. Thinking about life purpose and setting goals for personal growth and development. But the question ‘who am I?’ stumped me a little at first. It’s a really basic question but I didn’t have a simple answer. I decided to go and dig out some old photographs my Mum had given me a while ago which I have been meaning to sort but hadn’t gotten around to it. They were mostly of me as a child or a young girl – at home, with family, on holiday, with school friends etc. The quality of the pictures isn’t great but what struck me as I looked through them was how happy I seemed. In just about all of the photos I was looking straight at the camera, bright eyed with a big smile. I am pictured in all kinds of poses, apparently enjoying parties, vacations, animals, adventures and escapades. Also experimenting a lot with fashion! And I appear to be really enjoying myself. It’s been a long time since I’ve considered myself as truly ‘happy’. I always thought of my Dad as ‘Mr Joie-De-Vivre’ and that I just enjoyed being along for the ride. And when I lost him a couple of years ago I thought that was the end of abundant happiness in my life and I would just have to settle for ‘normal’. 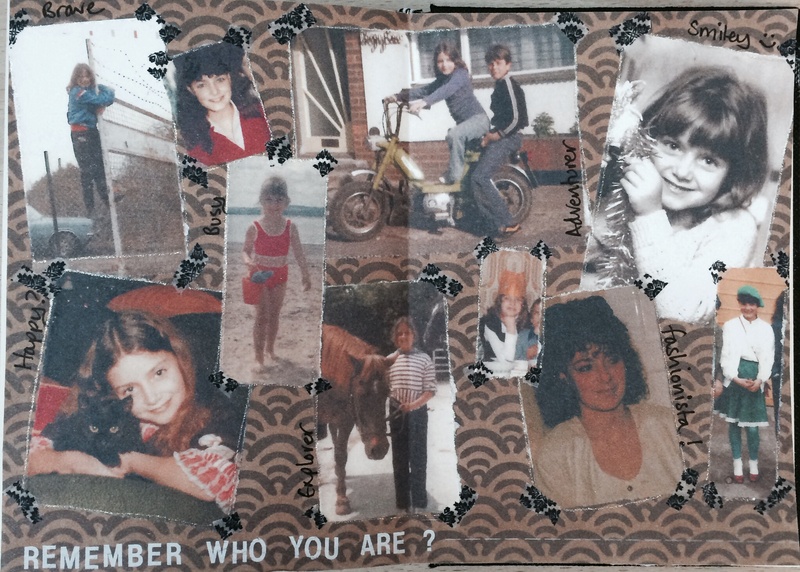 Through the misery of grief I had persuaded myself that my childhood had been quite difficult and traumatic. At age 8 my parents split up and an ugly divorce followed. This was a pretty scary and lonely time and certainly left me with a damaged self esteem. But unless I was doing a really good job at faking it, these photographs show another side of my life that I had blanked out. A plentiful supply of happy memories and good times that had been overshadowed by loss and fear. When I opened today’s journal prompt I thought – Oh my, how can I tackle this subject in half an hour and on one page!!! I’m sure it’s a lifetime’s work and I think I will only find out if I’ve succeeded once it’s all over and I get to debrief with my spirit guide! So I’m settling today for a traditional journal entry which I’m typing as it’s easier to re-jiggle ones thoughts as you go along…. What can I say so far about my LIFE PURPOSE. I am definitely on ‘the path’, that much I’m sure of. I have taken notice of myself growing as a person over the last 15 years and have documented many of the changes I have been aware of. I have shared those experiences and the wisdom that accompanies them with kindred spirits. I wake up each day excited about what’s in store, what will I experience, what lessons will I learn? I am using my gifts, although not yet to their full potential, and deep in my belly basement I know I’m heading in the right direction. 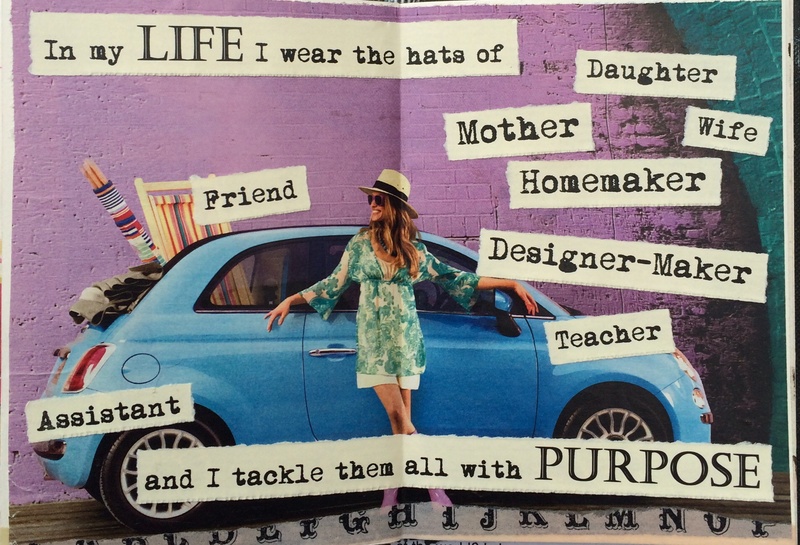 I wear the hats of daughter, mother, wife, homemaker, friend, designer-maker, teacher and assistant, and try to tackle them all with a sense of purpose. My guiding mantra at the moment is to BE MY BEST SELF POSSIBLE. My most significant gift is that I’m good at making stuff. I have been making things since my earliest memories. An avid watcher of Blue Peter and Take Hart, I couldn’t wait to open the craft drawer in our kitchen and recreate whatever had been demonstrated during the program. I would spend hours on my bedroom floor making ‘stuff’. Later on at school I became quite the entrepreneur making and selling jewellery and other crafty items to my friends. When life started to get serious and I had to think about earning a proper living I took a diversion and studied economics. But it wasn’t long before I found my way back to art by prioritising the most creative aspects of my job in marketing and then getting into interior design. I love the scene in the film Dirty Dancing where Baby’s dad is explaining to his friend that Baby is going to save the world, and she responds that her sister Lisa is going to decorate it. Well I am definitely a Lisa. I’m not to going to save the world but I’ll certainly try and make it as pretty as possible while I’m here. I am also more intent these days on questioning things. What should I be doing, what should I believe in, who can I trust, how do I make sense of the world? I share my spiritual quest with a few special kindred spirits, currently all soul sisters – but that’s just how its happened for now. I’ve been on the look out for a Guru of sorts and came across the Venerable Thubten Chodron and her insightful study of the Lamrim (a Tibetan Buddhist textual form for presenting the stages in the complete path to enlightenment as taught by Buddha). I listen to her teachings often for inspiration and guidance. I have also been seeking a more specific direction for my artistic endeavours, and in my search have come across some wonderful mentors like Kelly Rae Roberts, Sally Jean Alexander, DJ Pettitt and now Lisa Sonora. I still love making ‘nice’ things and creating a lovely environment but I have a deep desire to make some meaningful things too and I feel this is starting to take shape gradually. I want people to be inspired as well as delighted by what I make. I am happy to trust in the process and let things unfold in their own time. Alongside my personal exploration I have been lucky enough to get a great part time job as a potters assistant which takes care of my making urge. I am learning some wonderful skills while earning a small income too. I believe all these things are slotting into place for a reason. – Help and encourage others to find their way. Be a good friend.